The annals of crime will attest that malefaction, like any other history, repeats itself — as tragedy and then as farce and then simply with numbingly grisly monotony. Which brings us to San Francisco, for another forgotten crime of the century — a theater of the time actually produced a play called Criminal of the Century — that sent the Nancy Graces of the Gilded Age aswoon. Theodore Durrant‘s basic profile — normal-seeming medical student and Sunday school superintendent with a secret pervy side — might not seem so remarkable with a century’s worth of serial killer profiles in the books, but ponder what programming hours Court TV would fill with mutilated, violated female parishioners found stuffed in the cupboard and belfry at any of the nation’s Emanuel Baptist Churches. information poured in … proving that the prisoner was a degenerate of the most depraved class. For obvious reasons, names cannot be given of young ladies to whom he made the most disgusting propositions, and the wonder of it is that he was not killed, or at least exposed before. But in most instances the nature of his insults were such that the young ladies offended feared to inform their relatives, lest they would take the law in their own hands. One young lady told her mother that some time previous to these murders, Durrant had inveigled her into this same library and excusing himself for a moment, returned stark naked and she ran screaming from the church. The particulars were nationwide news copy from the outset in 1895 to hanging in 1898, and the city had a difficulty scraping together a jury qualified to give the man a fair trial (deliberation time: five minutes). 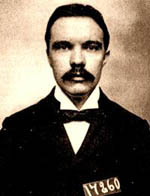 Durrant came within two days of execution twice in 1897; the full narrative of legal maneuvers will be amply suggested by the Times‘ account of those made in the last week alone. On January 5 Durrant’s attorneys made another application to the United States court for a writ of habeas corpus. This was denied; also permission to appeal to the United States Supreme Court. On January 6, Attorney Boardman arrived in Washington, and endeavored to persuade Justice Brewer of the Supreme Court to grant permission to an appeal. Justice Brewer declined, and Boardman announced that he would appear before the entire court on Friday and demand to be heard. In San Francisco on January 6, Attorneys Dickinson and Deuprey asked the United States Circuit Court for leave to file a bill of exceptions. … On the same afternoon, Gov. Budd formally announced that he would not interfere. Durrant’s beloved sister would change her name to Maud Allan and emerge as a popular dancer in Europe in the early years of the 20th century. Renowned for her sensual portrayal of Salome, Maud strikes an immediate reminder of another character from these grim pages … and like Mata Hari, Durrant’s sister was accused (non-fatally, in Maud’s case) of consorting with German operatives during World War I. * A paroled murderess also had Durrant’s back. ** According to the story, Smyth publicly called Durrant a “moral monster” and suggested that the condemned had had relations with his mother and sister.